Holy Week (Semana Santa) is a huge yearly event in South America: holidays from work, street closures, gory parades dramatizing Christ’s suffering, heaped-up sentimentality, sometimes drunkenness. But not everyone joins in the festivities. For many reasons, some valid and some perhaps not, evangelical and Pentecostal believers in Peru prefer to ignore Semana Santa. So when my husband and I spent Palm Sunday morning at a tiny church in the Peruvian Quechua village of San Gabriel, it was an ordinary Sunday there. We attended with my son Brendan and his wife Erin, who are missionaries in Peru. The church was a plain, one-room adobe building not much bigger than my living room. We sat on benches among the small congregation, men on the right of the aisle and women and small children on the left. My son broke with tradition and sat with his wife on the women’s side. He befriended one of the babies, and since Quechua people don’t put their children in diapers, he got peed on. Brendan laughed this off, as the people in the Andean villages do. Getting soaked by a baby is considered good luck! The gathering started off with music. The little village has electricity, though not much of it, and a young man played an electric keyboard, using the same chords over and over whether or not they really fit the song. A young woman sang into a microphone in the high-pitched, nasal Quechua manner. The people sang along. Certainly no amplification was needed in the little church, but they used it anyway: Brendan says they like to crank up the sound to spread the message to their neighbors. This was not an actual worship service; those are held in the evenings, after farm work is finished. So on this day the pastor, who is a local farmer, did not preach. 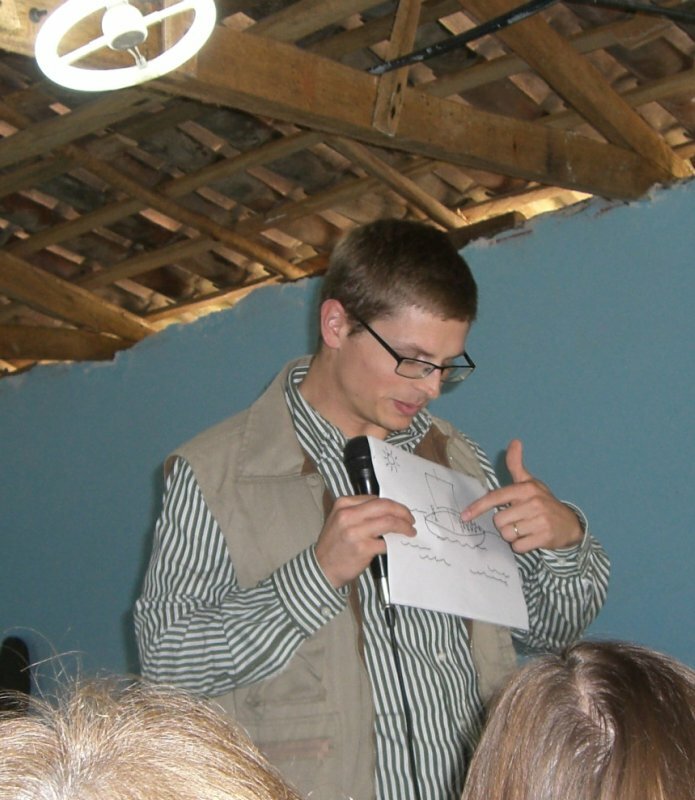 Brendan taught a Bible lesson, using the “orality method” that is proving effective with non-literate cultures. The story was of Jesus calming the storm on the Sea of Galilee, and at the same time calming and inspiring the hearts of His overwhelmed disciples. After a reading from the Quechua New Testament, Brendan re-told the story twice in Quechua, using his own words and showing stick-figure drawings. My husband had drawn the illustrations, and since he is an architect he could have produced some fairly realistic drawings. But Brendan had told him to use a style the people themselves could use. The point of the orality method is to make the telling of Bible stories do-able. When Brendan finished speaking, it was time for the people to practice telling the story to each other from memory, the purpose being to preserve their own knowledge of it and to be able to pass it on to others. To practice, the men formed one group, the women another, and the children with some adult leaders formed a third. Within each group the people passed around the drawings and took turns telling the story, some speaking in Quechua and some in Spanish. Although the Quechua do not have a strong tradition of story-telling within their own culture, it was clear they were enjoying this; they love good stories just as we do. And this story’s profound message of peace was not lost on these very poor people, whose lives could be thrown into upheaval by any downturn in weather or luck. It touched me to hear them speak the calming words of the Son of God. A week later I was back home, and on Easter I sat among the well-dressed of my home church. I listened to the trumpets, the handbells, the pipe organ. I listened to the pastor in the carved pulpit telling an amazing old story about the Son of God. And I thought back on the San Gabriel congregation: the women in braids, the baby without a diaper, the people passing around stick-figure drawings and telling an earlier chapter of the same amazing old story. And I know that with each retelling, whether we hear it in an ornate sanctuary or in a cracked adobe hut, the story works it way deeper into our hearts.